Chris and I are currently losing a battle with many-legged giants in our house. No, I don’t mean mutant wolf spiders or centipedes. We’re talking furniture, folks. I am constantly frustrated by the lack of flexibility we have with our furniture arrangement in our current living situation (rental condo), and we are both dreading the forthcoming day when we become a two-person moving crew and have to haul all of our giant pieces of furniture down narrow halls and stairs, around insanely tight corners with low overheads, and into a moving truck. But wait, how did the giants get here in the first place? Two and a half years after we were married (and extremely tired of using my old twin beds pushed together and covered with a king-sized foam mattress thing), we finally bit the bullet and bought the king-size version on sale. Enter Giant #1. Our bed is a gentle giant, though. 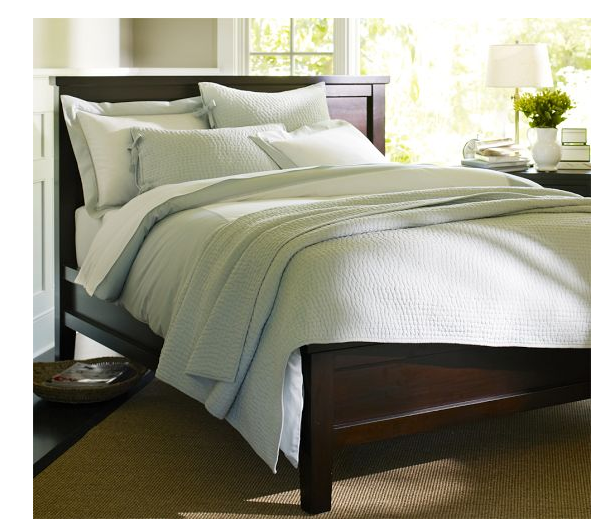 We absolutely love our bed and wouldn’t trade, sell, or give it away to anyone EVER. Of course, our love affair is made more complete by the mattress set we bought for it. Seriously, every time we lie down it is like going to a luxury spa retreat. It is, by far, the best investment we have made furniture-wise, so we are perfectly content with our gentle giant. Notice some trends? We do. Trend #1: Our home = Goodwill Donation Center. Mom: I’m giving the comfy chair away to Goodwill. Mom: It just doesn’t go with my new style, and I don’t really have room for it anyway. Me: But it is such a great chair with so many memories! Mom: I know, but I’m giving it away unless you want it. (Chris in the background): Tell her we’ll take it. This is also how we amass random home decor from Chris’s grandmother and my parents. 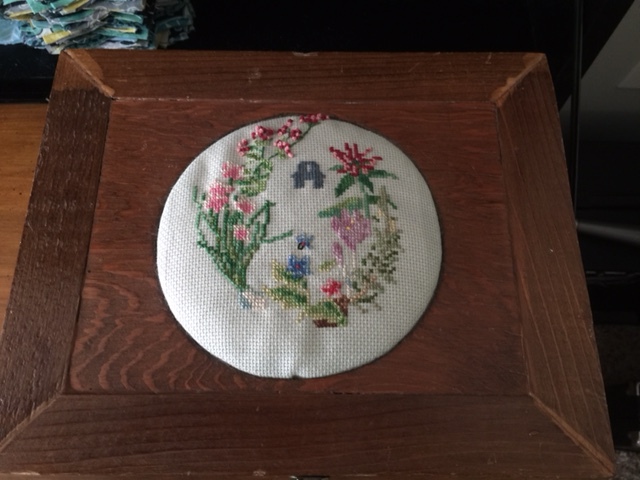 In fact, every time we visit Chris’s grandmother, we bring home a carload full, and I frequently receive boxes of my mom’s old teaching stuff, family photos, home decorating accessories, knickknacks, linens, etc. that I tend to sort through before sending to Goodwill or selling. I also inherited 14 place settings of china from a relative, in addition to 2 we received as a gift from Chris’s grandmother and the 10 we received as part of our wedding registry. I’m the only child of a mother whose only sibling has already passed, so I will also inherit her china…and her mother’s china…(you can see where this is going, can’t you?). With that much china, I should be able to open a restaurant soon, which is good since I’ll need the restaurant space to store it all! Lorie Marrero, creator of the Clutter Diet (check it out here: http://www.clutterdiet.com/) recommends stopping clutter before it enters your home. Great advice! When you are trying to be frugal and not spend money on things, though, it is hard to pass on “perfectly good” items, especially items you don’t have as a young-ish couple..and if some of these items tend to be made better than they are now. For example, we have gone through two butter dishes since being married 7 years ago, including a Le Creuset one! Our Corningware dishes have hairline fissures…not so with my grandmother and mother’s dishes (the ones with the blue emblem on them) that will probably outlast us all. Maybe they will make cool homes for the cockroaches at the end of the world. Trend #2: Modern farmhouse style = no room in the inn, or at least, in the condo. Chris and I have very eclectic taste but trend towards a cross between European farmhouse and mid-century modern. When we were homeowners, this was not a problem. Our first home had a spacious, open concept that was perfect for our tendency to prefer big furniture designed for large spaces. Unfortunately, I decided to go back to school in an urban area where housing is $$$. In fact, our city is one of the few places where the housing market has continued to swell despite the general economic/housing market situation. Our rent even went up this year (le sigh). Suffice it to say, we live in a “spacious” 3 BR/2BA condo that feels like the size of a mouse hole with our furniture in it. We even had to buy in the “suburbs” and spend more on our rent than our original home mortgage to have room enough for all our stuff. Problem? Definitely. But what could we have parted with? Trend #3: Furniture sales = furniture clutter. Trend #4: Parting is such sweet sorrow. We have been clearing out clutter for about a year and a half, and we have done some serious purging…of everything except the furniture. My clothes used to take up two closets, a dresser, and a chest (that’s what happens when you don’t grow and can still wear your clothes from high school). Now I use a chest and share the master closet with my husband. Craft supplies have been used or donated to teachers. I’ve even parted with some books, which is incredibly difficult since I’m a bibliophile. The final frontier is the furniture, but the giants have to go. Trouble is, we are struggling with what to give away, sell, and repurpose, especially since almost all of these pieces see frequent use or will, once we have kids and need additional bedroom furniture, seating, and such (read: near future). Anyone else have some giants that need to find a new cave home? Any ideas on how to conquer our giants?